To spark discussion, the Walker invites local artists and critics to write overnight reviews of our performances. The ongoing Re:View Series shares a diverse array of independent voices and opinions; it doesn’t reflect the views or opinions of the Walker or its curators. 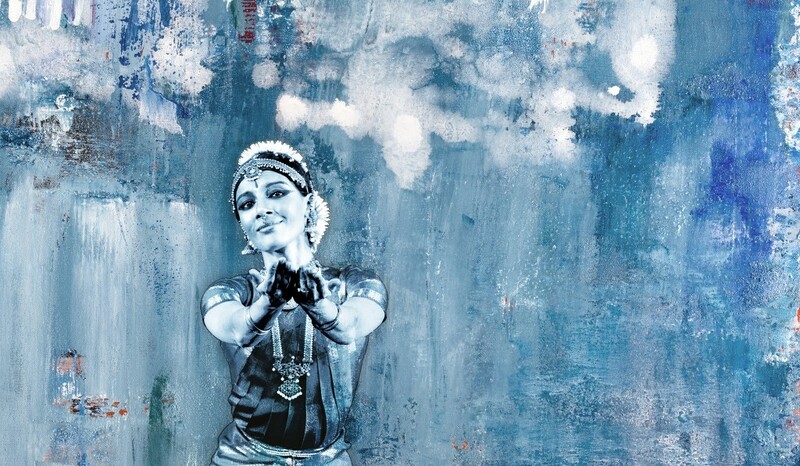 Today, local dance artist Sally Rousse shares her perspective on the opening night of Ragamala Dance and Rudresh Mahanthappa’s Song of the Jasmine. Agree or disagree? Feel free to share your thoughts in comments! Five dancers in a line on the right facing five musicians to the left; several bells hang at various lengths above the dancers while subtle smoke and lights begin to warm the McGuire Theater at the Walker Art Center. I like the lines, the minimalism. I like the small cast, the parity, the program notes that promise “feverish urgency” and “the inverted.” A teenage female mystic poet. I might like this show more than any other Ragamala Dance performance I’ve ever seen over the past 20 years. Song of the Jasmine – a collaboration between Minneapolis’s Ragamala Dance and New York-based jazz saxophonist/composer Rudresh Mahanthappa – cites the writings of 8th century Tamil mystic poet Andal as inspiration. Legend has it that Andal was a sort of foster child, found and raised from birth by Vishnuchitta, a Krishna-focused poet. Brought up with these poems, songs, devotional texts, it’s only natural that the girl would refuse to marry any mortal. Instead, she had a spiritual marriage with a deity of the lord Vishsnu and was consumed into light. Her Nachiyar Tirumozhi, the composition guiding Song of the Jasmine, was Andal’s second and final work, regarded as sacred text on par with the Sanskrit Vedas. She was only fifteen. One stunning scene has the three beautiful Ramaswamy women in an extended trio that, in variations, seems to tell the story of a girl longing with all her heart to be united with her Loved One, the Divine: He makes her heart beat; He’s like a bee finding nectar in her flowering youth; there is no aroma to compare to that of the Divine; love has invaded her veins. I think there are snakes, too. And there is compelling floor work, drawing in the sand, writing it all down. I saw Ranee “loosening the braids of reason” and Aparna dancing the line “my vow to him courses through my body.” Then, it turns sad, there are tears of unrequited love: “while I pine and sigh for his love, He looks on indifferent.” Teen angst. The performance had the traditional Bharatanatyam costuming (jewel-colored pleated fabric, bells, red painted hands and toes), and postures (bent knees, arched lower back, slight smile, expressive roving eyes) as well as the percussive marching backwards, articulate mime, and what I like to call “Indian waltzing” in ¾ time. But Ragamala is committed to dynamically weaving their classical South Indian dance form into their American existence. And so much more. I saw some interesting extensions into contemporary movement that includes supple arms and backs and a softness that took Aparna to the floor and somehow back up again like no one else but Hijack’s Arwen Wilder can do. Whoa. Aparna and Ranee Ramaswamy’s choreography and Mahanthrappa’s jazz-Indian music drove each other powerfully and was surprisingly sensual. The drumming anchors the movements while the sax often leads the narrative. There are star turns by everyone: the guitarist, Rez Abassi, playing really weird stuff; solos for the always joyful Tamara Nadel and incredible lunges and balances from Jessica Fiala. The Carnatic Violinist, Anjna Swaminathan who has been working with Ragamala in recent years, makes it look easy. (If you’re wondering, like me, whether “carnatic” has anything to do with “carnal” or “carnivorous”, it doesn’t. But Swaminathan does play the violin like she’s hungry). When the flutist Raman Kalya takes over for a bit it’s amazing how his positions match Ashwini Ramaswamy’s arms and torso, as though she, too is holding and playing the music. Ashwini is a gorgeous dancer, so strong and exacting with a really satisfyingly flexible, playful neck. Rock solid balance and delightful, every single moment. Aparna — what more can be said about her as a performer? She’s confident, brave, intelligent, and in her prime, yet she shares the stage generously, with a new maturity that is alluring. Ranee, who just won a prestigious Doris Duke Artist Award, is stunning: the most present and hip, just oozing natural experience and knowing. Andal should have lived such a life. Ragamala Dance and Rudresh Mahanthappa perform Song of the Jasmine in the Walker’s McGuire Theater May 15-18.